Gentle training for your dog. 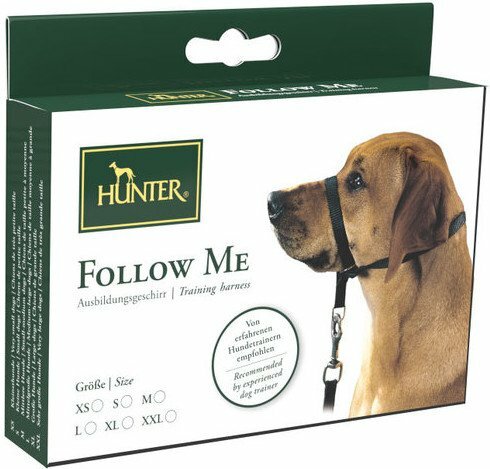 Follow Me is an easy-to-use harness which greatly increases the ease and effectiveness of training and education your dog through its wide variety of functions. The individual functions are designed to reproduce measures found in the animal world: light tension on the bridge of the nose and neck gently discipline your dog without interrupting or hindering his natural movements. Due to the specially designed metal ring, the nose strap no longer slips off the nose. 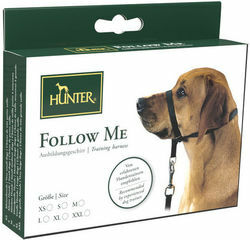 In addition, the harness can be converted into a training collar. This is achieved by lengthening the throat and nose straps a bit, opening the catches of the nose strap loops and pulling the strap over the dog’s head. The catches are then placed around the dog’s neck and fastened.